Choosing the proper slalom ski length is important for a variety of reasons. Not only does ski length affect your speed and performance but it is also a factor for safety reasons as well. One form of alpine skiing is slalom. This type of skiing involves maneuvering between gates which are poles that are spaced closely together. It requires the skier to make sharp turns very quickly and have total control over their skis. Slalom skiing is a competitive sport that both men and women compete in. It is one of the sports featured at the Olympics. 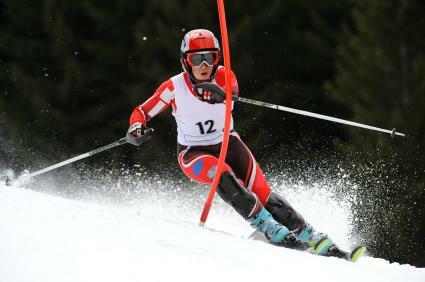 Another form of slalom skiing is giant slalom. This version uses less gates and gives the skier more time to navigate between them thus requires less turning. Both forms do require the skier to move at great speeds. Slalom skiing requires specific equipment. Slalom skis are designed differently than regular downhill skis. They are longer and narrower and provide stiff control. They are not used for regular skiing due to their design. In order to master the sport, it is essential that your skis are the correct size. This is important so you are able to turn quickly and control your speed. It is also important so you are able to adjust to a variety of terrain. Ski length varies between men and women and there are several factors to consider when deciding on the right size ski. For racing, slalom ski length for men is a minimum of 165 centimeters for men and 155 centimeters for women. These requirements are set by the International Ski Federation. In the past, skiers at competition such as the World Cup were permitted to use skis as long as 207 centimeters but now the length requirement is set to be shorter. For those who are not racing, but slalom skiing for recreation only, ski length can vary from 160 centimeters to 176 centimeters. Slalom skis are designed to be shorter than other types of skis due to the high speed used for the sport. The skis are also designed to be precise for a short turning radius and have pronounced edges and sides. Slalom skis are not cheap. A quality pair can cost between $500 and $1,000. If you shop during off season, you may be able to find a great deal on a pair from the previous season. Since the skis are costly, it is essential to be sure to get the proper length. One way to try out a ski in a specific length is to rent a pair before purchasing. This option gives you firsthand experience and allows you to be the judge of what length ski you feel the most comfortable with. Most of these options will be able to give you guidelines on ski length as well as other helpful tips to make sure that you are using the proper equipment.